The dramatic landscape of northern Scandinavia is that of the midnight sun, northern lights, and the Sámi--the indigenous peoples of Norway, Sweden, Finland, and parts of Russia. The Sámi were once tribal nomadic peoples that followed the migration of the reindeer. Traditional Sámi jewelry incorporates elements of their northern landscape – softened reindeer leather, braided pewter wire and sculpted antler. Liz Bucheit is the award-winning goldsmith and jeweler of Crown Trout Jewelry in Lanesboro, Minnesota. 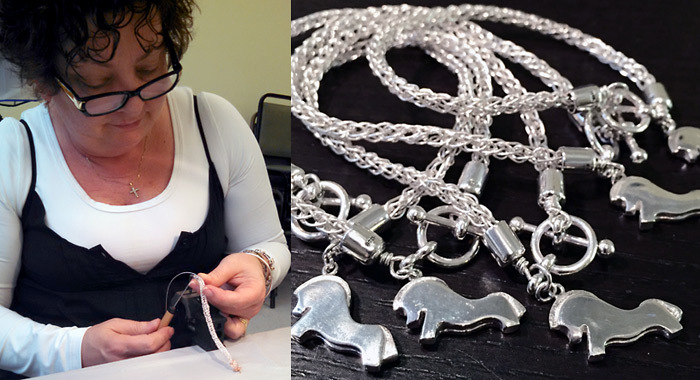 Liz holds a Master's degree in metalworking and jewelry from the University of Iowa, Iowa City. She has trained in traditional jewelry techniques in Ireland and Norway. $40 per person for class. $95 materials fee for beginners, $125 for advanced materials--paid to the instructor at the time of the class. Held at Ingebretsen's East Lake St. store. A previous class is scheduled for Saturday, March 31.